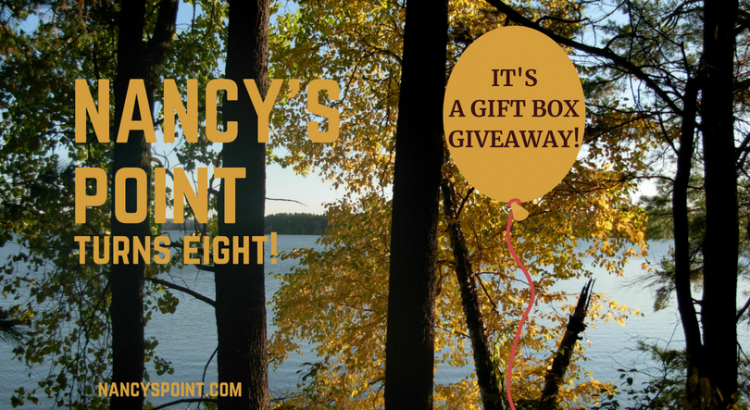 Nancy’s Point Turns Eight & A Gift Box Giveaway! This month marks eight years blogging for me. Eight years! Sometimes it’s even hard for me to believe I’ve been at it this long. When I started, I had no idea how long I’d continue. Actually, I had no idea what blogging was about, period. It’s a learn as you go sorta thing. And believe me, I’m still learning. And I still don’t know how long I’ll keep at it. What’s in store for year nine? I’ve got a few things up my sleeve. I can’t give away all my secrets in this post though. No, this post is to say, thank you! Thank you, Dear Readers, for sticking around. A few of you have been reading since day one. Okay, not since day one, ‘cuz at the beginning nobody was reading except Dear Daughter (Thank you, Lindsay). But some of you (you know who you are) have been reading for years, and I’m grateful. If you’re new here, welcome! If you’re somewhere in-between, thank you to you as well. Readers keep bloggers going. Or at least readers keep this blogger going. Next week, I’m going to share a bit about my blogging experience, how it’s evolved, my goals and answer a bothersome question I was asked once that’s always lingered in the back of my mind. I’ll also talk about a couple changes I’ve made and why I made them. And maybe I’ll share that blogger/writer pet peeve that’s been on my mind, but that I haven’t gotten up the nerve to write about yet. But for now, THANK YOU for reading Nancy’s Point! I’m still putting the boxes together, but each will include my two books (if you’ve read them, I’m hoping you’ll pass them on. Thank you! ), a bunch of little surprises and a personal thank you note from yours truly. Here’s to another year of keeping it real and hopefully offering support you can use. Let’s tackle year nine together! ‘Cuz who wants to navigate the cancer maze alone, right? Thank you for reading Nancy’s Point! Don’t miss out! Get weekly updates delivered right to your inbox. Keeping it real. Support you can use. Would you like a chance to win a FREE gift box? All you have to do is answer one of the questions below AND state that you’d like to be entered in my giveaway by 5 pm on Sept. 18th. That’s it! A US mailing address is required. Winners will be announced here on this post shortly thereafter. The gift box winners are Linda B. and Angela. Congrats, ladies! What topic(s) would you most like to see addressed on the blog in year nine? Why do you read Nancy’s Point? Here’s a peek inside my gift box. Please address any new studies re AI’s and enter me in the giveaway. Thanks! Karen, I try to stay on top of such studies and will continue trying. You’re entered. Thank YOU! I am a five year survivor of stage 2B invasive lobular carcinoma, involving 3 lymph nodes. I had a double mastectomy, 8 rounds of chemo, reconstruction . I also incurred blood clots in my lungs during the second surgery. I took letrozole for 4 and a half years but have recently stopped due to side effects. I would be very interested in hearing more about reoccurrence and the research letrozole plays. Your blog is often my go to forum for information so I am grateful you continue your blog. Please enter me in your give away for Sept, 2018. I agree with Mary Ellen that I would like to hear more about the possibilities of a recurrence and what others have experienced. That’s my biggest concern at this time. Every ache and pain makes me think my cancer has returned, but tests prove that it has not. It’s been 23 months since my diagnosis of stage 3 ILC. I would like to hear from others how they knew that what they were feeling was a recurrence. And I would also love to be entered in your giveaway. Thank you Nancy for sharing your blogs with us and for giving us the opportunity to share our stories. Donna, I will keep your suggestion in mind. Did you read this post? http://nancyspoint.com/breast-cancer-recurrence-lets-talk/ I will address the topic further if I can come up with a fresh angle. Thank you for participating in my giveaway, Donna. You’re entered! Mary Ellen, Congrats on your five years. I’m glad you find the blog informative. Thank you for being a loyal reader and for participating in my giveaway. You’re entered! Ok since being overweight raises our re occurrence rate, can you ask how other women are dealing with that? I appreciate the contest entry too! Carol, Weight is always a topic of interest. Personally, I try to focus more on exercise and overall well-being. Have you read my posts about exercise? What question(s) specifically, would like me to ask other women about weight? Thank you for the idea and for participating! 2. I’d like to enter. 3. Practical hints. Ie today I put my T-shirt on inside out because my sore underarm is chafed. Tips for handling the nerve reconnection underarm discomfort. I do admire you all. Donna, Thank you for sharing why you read. I hope you feel somewhat less overwhelmed, but your surgery is still very recent, so be patient. There is so much to absorb and so much to adjust to. That feeling does get better, but it never disappears for good. Thanks for that very practical tip. I read your blog Nancy for many reasons and Congratulations for 8 years of helping people! I was unaware of so many things going thru my breast cancer and your book and blog guided me and relieved many fears. Some of my doctors were amazed how much I knew so shortly after diagnose and it was because of your blog! I look forward to each new topic. Please enter me in the gift contest. How nice of you! Roberta, Thank you for the kind words. It’s always nice to hear my posts have helped in some small way. Your comment about your doctors made me chuckle. Thank you for sharing and for participating in my giveaway. It’s a fun way to say, thank you. Too bad I can’t send one to everyone who enters! Thank you so much for sharing all you do. You have connected me to others who have had the devasting lifechanging diagnosis of breast cancer. I am a 4 years out since diagnosis and have finally felt empowered enough direct my life in along a healthier way. Met with an Integrated/Wholistic Practioner and have made the committment to follow (not blindly) recommendations for healthy eating and living. Cleaning up my diet has made huge positive impact. I would appreciate any information/insight into healtjy eating, YOGA, simple living. Please enter me in your gift contest. Mary, Thanks for the ideas. I do have several posts about exercise. I haven’t written about diet as that’s very unique to each person’s life and life style. I’ll keep it in mind though. Maybe sharing what others are doing might work. Thanks for participating in my giveaway, and thank you for reading Nancy’s Point! I read your blog because it was the first one that stood out to me about being honest and frank.. I am not grateful about cancer, pretty sure it didn’t make me a better person lol and pinktober drives me nuts among many things. I would like to go more in depth about post cancer… do you keep your job, change your job, does 8 hours exhaust everyone, the anger that sneaks up, the sadness, fears, your significant other has moved on from the trauma, will we?… is tamoxifen causing all the issue? What does this life look like, 3 years out, 5 years out, 10 years out. Leslie, Thank you for those suggestions. I will keep them all in mind. Next week’s post will begin to address the career topic. I do want to delve into that topic further. Good luck in my giveaway! i would like to enter your contest, too! I can’t remember how I found Nancy’s Point, but I wait for it – excitedly – every week. I think having come through Stage 3 breast cancer, but living in fear of it returning or settling elsewhere, I looked for something that was informative and honest. I found that here. Thank you! I look forward to year 9 and beyond. Linda, You’re very kind to say those nice things. Thank you so much. And you’re entered. I’m going for my first chemo treatment tomorrow afternoon. My cancer is stage 1 C. I had fallen in April and while doing rehab across the street from the med center I decided to get an early mammogram. Good decision. I had to get a stereotaxic mammogram on the left and there was cancer in there. Not too bad, already had lumpectomy. My surgeon had to go back for seconds; cancerous margins. I got a port on the right side also. The blood draw before the second surgery left my arm looking like a black eye and it was painful. I am 69 years old and it seems like something goes out of whack bodily every year. Got surprised on 65th birthday with a diabetes diagnosis. I found this site by accident but I’ll be checking it now! Please enter me in your drawing. I love free stuff! Kathy, I hope your first chemo infusion went okay. I’m sorry you have cancer and diabetes as well. That’s a lot to deal with. Good luck with everything and welcome to Nancy’s Point! Congrats on your 8 years of blogging! I can’t believe it has been that long! You have helped many, many people. Lindsay, I know. I can’t believe it either. Thank you for all you help and encouragement since day one. Glad to hear you had a nice break and just wanted you to know I missed your weekly emails. I have been a subscriber for almost 2 years now and I sure appreciate your honesty and candor in all you write. I find great comfort in knowing that I am not alone in my aches, pains and fears. Thank you again for all of your time and devotion to helping us all “talk about it” and become more informed. Tarzangela, Thank you for being such a loyal reader and subscriber, too. I appreciate your kind words very much. And yes, there’s some chocolate in there! Thanks for participating! Why do I read your blog? Because you’re very *real* in how you express what you’re going through / have gone through. My diagnosis came Thanksgiving Eve 2016, turned out to be stage 2B (1 lymph node involved), ILC on the left side, and IDC & DCIS on the right. 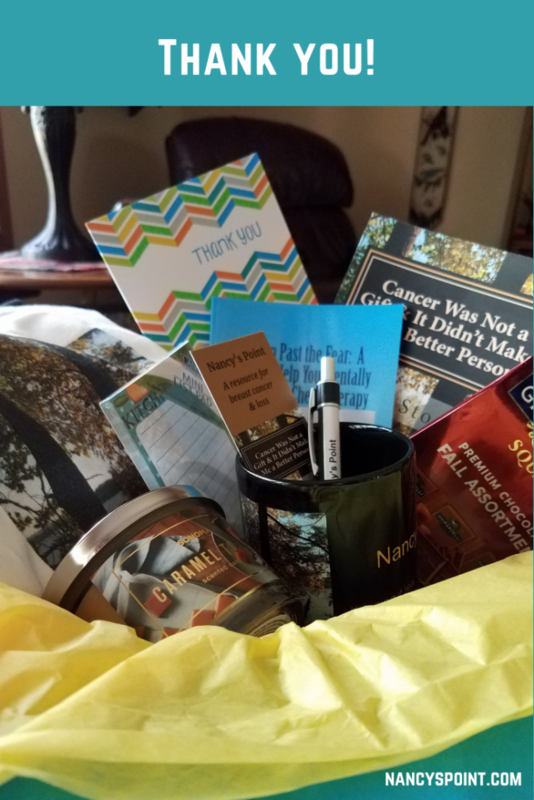 Some time after my DMX in January 2017, I came across your book “Cancer was not a gift and It didn’t make me a better person” and my first thought was “Finally, someone who gets it!” I kept your book alongside me as I recovered in my recliner, and then found your blog and have followed you ever since. (I also changed oncologists right after the surgery; scary, but so the right thing to do! And your experience gave me courage to do just that.) Reading your blog feels like hearing from a friend; sorry that has been a bit one-sided, as I don’t write you back! 🙂 Do know that your words are read, they are important, and they are very, very helpful. And yes, I would love to be entered in your giveaway, please. Sarah, Thank you for sharing why you read my blog. How awful to be diagnosed on Thanksgiving Eve, but then it’s not like there is a good time. It’s nice to hear my book was helpful. I appreciate you taking time to share and thanks for participating in my giveaway. Good luck! Hi Nancy… I discovered you about a year ago on a listing of the top breast cancer blogs in the country. You most definitely belong there at the top! I was treated in 2002 for DCIS in my early 40s. 12 years later I had a recurrence at stage 3A and got the works done. Each time just the tiniest of calcifications showing up on a mammogram. I’m four years out from the last diagnosis and doing well. You and your readers are a great support and source of information. Like many of you, talking about any of this with our family and friends just makes them uncomfortable… so I rarely do. And I really want to move on as well, as hard as that seems some days. Anyway keep up the good work Nancy and I would also like to be entered into your contest. Thank you! Betty, Thank you for sharing how you came upon the blog. I’m sorry you had a recurrence, but I’m glad you’re doing okay now. Thanks for your kind words and thank you for participating in my giveaway. Kimberly, Aww, thank you. I count you as a dear friend as well. Thank you for commenting and entering my giveaway. Winners will be announced next week as I haven’t done the drawing yet.